Published on 9/9/2008 in Funny and Tech. 0 Comments Tags: doomsday, Half-Life, Large Hadron Collider. Create a microscopic black hole which will devour the Earth. Trigger the hypothetical vacuum metastability disaster. Create a strangelet that will devour the Earth. The whole thing is reminiscent of the fear many years ago that the first atomic bomb test would burn the entire atmosphere of the planet. There another possibility that the kooks don’t seem to have considered. The LHC may open a gateway to a parallel universe full of evil creatures. 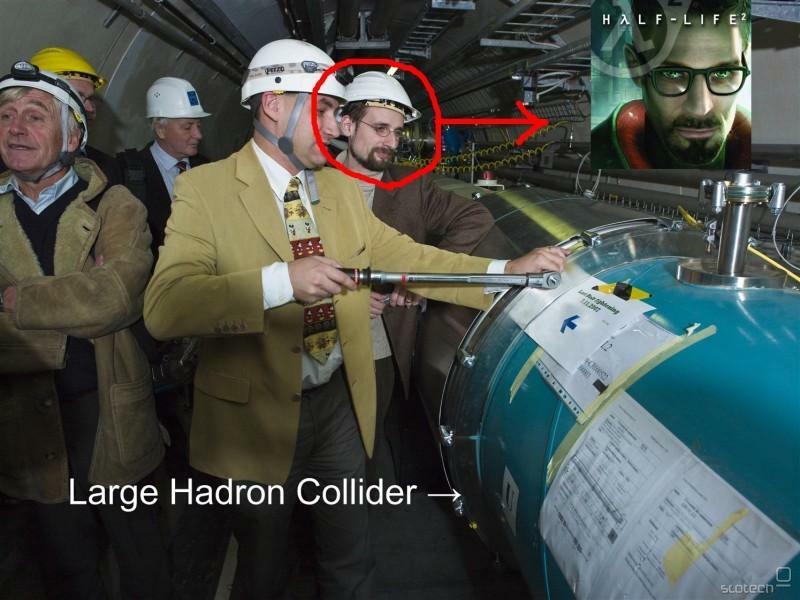 In the background... isn't that Dr. Gordon Freeman of the disastrous Black Mesa project? Here is a page with some really amazing pictures of the LHC under construction.